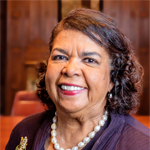 This month, we highlight our sixth president, Dr. Karen Schuster Webb, who took office July 1, 2018. A. Leadership is the ability of a person of integrity to articulate a vision that will enhance an organization and its ability to serve its stakeholders. A leader must then be able to build and inspire collaborative teams who will work to make that vision become a reality. Indeed, effective leadership involves listening and learning from others. Most importantly, leadership must be earned through the trust of those who are being served. Q. What do you want to accomplish as president of Union? A. As president, I am committed to providing leadership in coalescing the team effort to enhance Union’s growth and sustainability fostering, A Perfect Union; restore Union’s visibility as a socially responsible and innovative national university with the capacity to serve the world, and to honor our founding “university without walls” legacy by re-launching Union’s Institute as a consortium division of the university, which will focus on solutions to the social justice issues impacting our lives globally. Q. You are the new chair of the American Council on Education’s Women’s Network Executive Council. Why is this work important? A. The importance of the American Council on Education’s (ACE) Women’s Network Executive Council (WNEC) lies in its work as one of the largest international systems of women’s networks in higher education senior leadership in the world. Union is a member of ACE. In addition, there are ACE affiliate Women’s State Networks, which focus on this work in states where Union has national center locations. WNEC’s primary goal is to advance and support women in higher education, and we founded the Moving the Needle initiative, which promotes the selection of women as 50 percent of the college and university presidents by 2030. This goal would begin to match the gender population of higher education students. Moreover, through our IDEALS programs (Identify, Develop, Encourage, Advance, Link, and Support), members of the council engage in the very important work of mentoring women who are seeking careers in higher education leadership; facilitating the sharing of best practices in higher education administration, and enabling network professional development. Q. What do you like to do when you aren’t working? A. Away from work, I enjoy relaxing with family, reading mystery novels, and writing Haiku poetry. A. The Bible has been the most meaningful book in my life. However, over the years I have been drawn to interpretations of Biblical teachings in the writings of the novelists: James Baldwin, J. California Cooper, Gabriel García Márquez, Toni Morrison, and J. D. Vance. A. It would be difficult for me to cite only one; therefore, my top three inspiring leadership quotations are the following. Q. What might surprise the Union family about you? A. I have formal training in ballet and modern dance. Union has many leadership degree programs designed to make you an effective leader. The Bachelor of Science major in Organizational Leadership is designed to open doors to an endless supply of careers. The professional seeking to climb the corporate ladder will benefit from the Master of Science in Organizational Leadership. The Master of Arts major in Leadership, Public Policy & Social Issues enhances the understanding of conflict within public, private, and nonprofit institutions. The Master of Science in Healthcare Leadership degree prepares the student to be a leader within the healthcare career. New this year is the Leadership in Public Service (LPS) Certificate, a joint venture with the MLK Freedom Center in Oakland, California, that presents an opportunity for those interested or involved in mid-level public administration to become a “transformational leader,” or a leader who wants to make a difference. The Ph.D. major in Ethical & Creative Leadership (ECL) focuses on the vital areas of creativity, innovation, and ethical intelligence. Today is the day to choose a leadership program. Click below.